This was her splash page last week and more indicative of what they've looked like for most of her campaign. 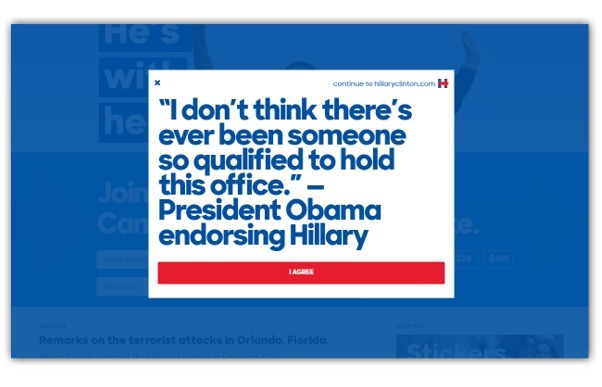 Clearly, this was just after she got the endorsement from President Obama, which is actually not a bad time to implement a splash page. It's a temporary announcement of a huge news event. 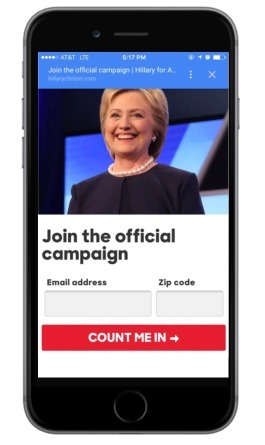 However, a much better implementation of this splash page would have been a quieter and more polite ask of the visitor to add their name along with President Obama's in support of her -- as well as a polite option for 'no thanks, I'm just investigating right now. This whole approach is a little surprising. With a campaign that spends so much time and money on measuring and optimizing, they have an opportunity to be courteous to their visitors and to learn critical information about them and they instead opt for the bully approach to harvest emails. Also, the small link to 'continue to website', misplaced at the top so to not compete with the large bold 'agree' button is just a bad practice in ways that we outlined here. Hopefully, you did not think things were going to straighten out when mobile came into play. If you did, then I have bad news for you. I landed on this a few days ago and it's what prompted this article. One thing that we know is that on mobile devices, the bounce rate goes considerably up when visitors are presented with unwanted content. Yet, here on HRC, you see the same un-bypassable splash page. (not sure if un-bypassable can be considered a real word but we're sticking with it). There is no telling how many users scrolled and pinched to find the 'skip to website' link, only to give up. I know I scrolled around for a few seconds before I shockingly realized there was no skip link.